When one thinks of the bolo-tie, what comes to mind is an easy-to-make piece of jewelry you made for your dad with Christmas Tree ornaments, dry macaroni and Elmer’s paste. In other words, something you made when you were a spaz in Kindergarten. However this Bolo-Tie designed by Lionel Dean, revealing the artist’s love for detail and ironic views on the world, is just a slightly more complicated work of beauty. 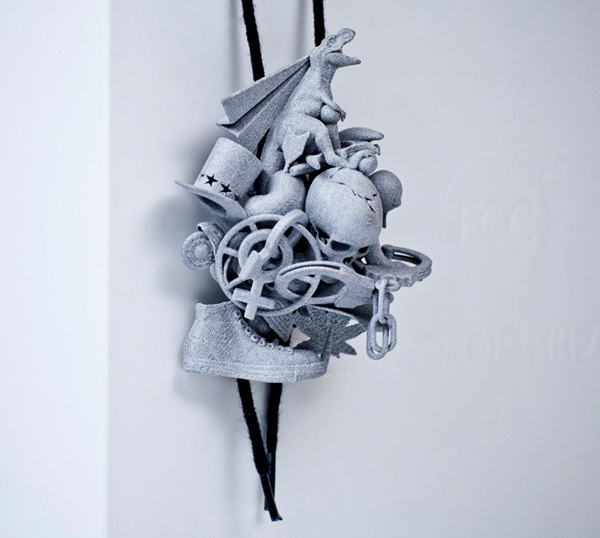 As part of the FOC Collection by pioneering design and research company Freedom of Creation, the Superkitsch Bolo-Tie is one of several products that are the result of innovative design using 3D printing technologies. Featuring a collection of ironic hipster icons like skulls, sneakers, handcuffs and a Tyrannosaurus Rex, the Superkitsch Bolo-tie is made via Laser Sintering and is available for about $80 (€65) in Ruby Red or Grey Sparkle (above).